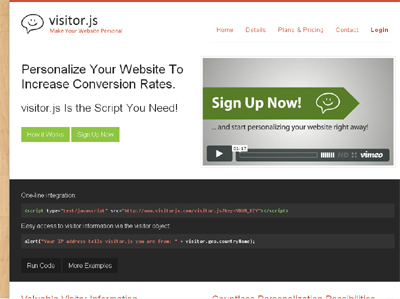 The visitor.js script tells you the location of the visitor, the search term that brought him to your website, on what page he initially landed and the browser and operating system being used. Using this data, you can welcome visitors in their native language, offer returning customers special discounts, include Google search keywords in the page title and optimize your pages in many other ways. visitor.js is unique in its kind.